PayPal doesn’t use an email address of mcaji8@suddenlink.net, ever. They would use something like security@paypal.com. 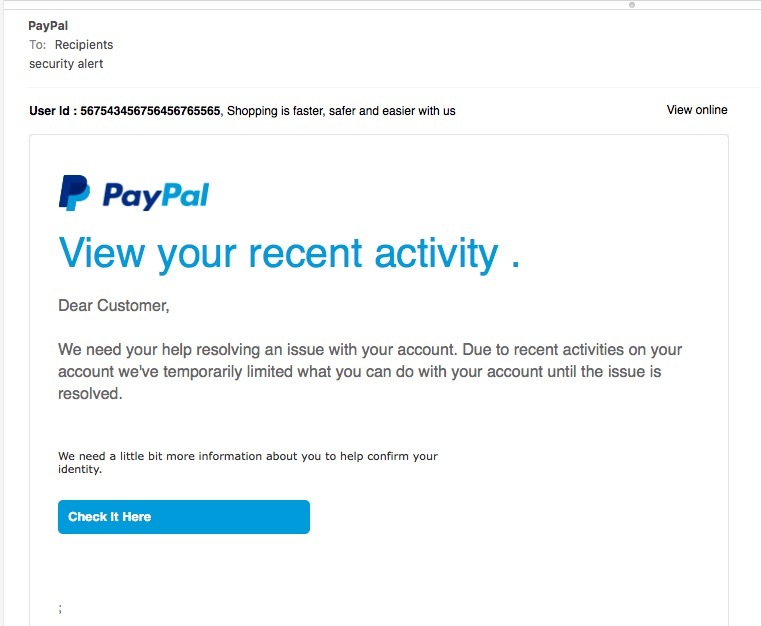 PayPal does recommend that when you receive a suspicious email to simply forward it to them at spoof@paypal.com. See how this fake email is using the same address in both the To and From fields? That’s another give away that this is not a legitimate email message. Certainly PayPal doesn’t use web addresses like www.uptownpaint.com to ask for my login credentials. Be very hesitant to reveal your username and password for any online account, unless you are 100% certain that it is legitimate. By just checking the email fields like To and From, or the action Button you will protect yourself from a phishing scam trying to steal your identity.